Your weekly round-up of local news for 1 – 7 October . In an incident that will play into the hands of the anti-Barton Park campaigners in Northway, a 13 year old boy was injured three weeks ago when he was hit by a car at the new light-controlled crossing on the A40. The car driver didn’t stop and the police are belatedly asking for witnesses or information. A new Couch to 5k programme started on Thursday at Bury Knowle Park. It’s probably not too late to join in; this well-established programme is designed to get you fit with a gentle progression up to running 5 kilometres. I went to see A2Dominion’s pre-application exhibition of their plans to redevelop the Ivy Lane flats at the JR and to build some new accommodation on Churchill Drive. My brief report is here. 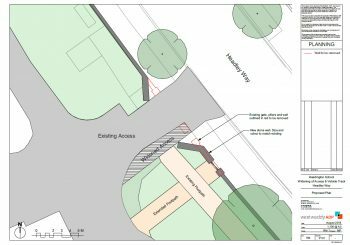 A small scheme (planning ref: 18/01964/FUL) to widen the access to Headington School from Headley Way was approved this week. The wider opening will mean vehicles can drive in from Headley Way without having to wait on the road if another vehicle is trying to get out. The drawing below, submitted as part of the planning application, seems to show that the changed layout won’t interfere with the new cycle track to be built as part of Access to Headington. The papers have been published for the Planning Review Committee meeting on Monday 15 October to review the refusal of planning permission for the Swan School. The recommendation is to overturn the earlier decision and grant permission.